The Coen brothers are known for some quirky and iconic characters in their films. So it is with great anticipation that their newest feature that will be shown on Netflix after a limited theatrical run will offer the same. It premiered at the 75th Venice International Film Festival on August 31, 2018, where it won the Golden Osella Award for Best Screenplay. There are six chapters with different stories and cast. On the streaming service you can view each chapter which stands on their own. As one long feature, it's not quite as engaging and somewhat depressing. 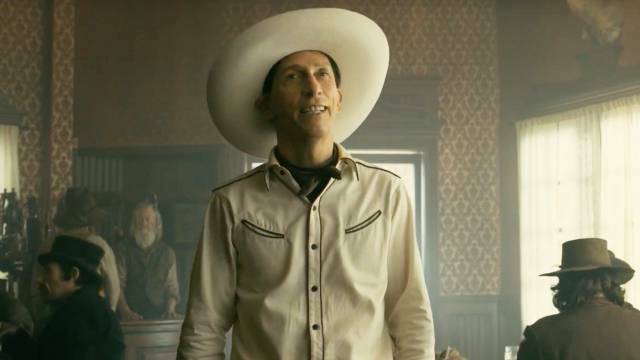 The first chapter is The Ballad of Buster Scrugss with Tim Blake Nelson as the singing gunman. He's forever in a pleasant mood while shooting down folks who want to take him out. James Franco is the lead in the next story Near Algodones who gets accused of a crime and set to hang a couple of times. Liam Neeson and Henry Melling are in a traveling show in Meal Ticket where the limbless artist recites Shakespeare and Lincoln to local towns. All Gold Canyon has Tom Waits as a prospector who comes upon a peaceful valley looking for gold. The Girl That Got Rattled has Zoe Kazan as part of a wagon train who finds love and Indians. Tyne Daly stands out in Mortal Remains in what may be a stage coach to the dark side. The performances and the stories are all unique in their own ways. Buster Scruggs is the standout of the chapters and despite the body count it's funny and what one would expect from a Coen brothers tale. Near Algodones is full of colorful denizens especially Stephen Root as the bank teller in the middle of nowhere. Meal Ticket gives you the feeling of never ending darkness that gets even darker. The appearance of a prospector in a beautiful valley has all the wild life leaving until their peace is restored. There seems to be a bigger story on the wagon train as the young woman left alone when her brother dies and finds companionship and maybe love with the wagon leader (Bill Heck). The last story has Brendan Gleeson, Jonjo O’Neill as bounty hunters, a Frenchman (Saul Rubinek), a trapper (Chelcie Ross) and Tyne Daly telling tales crammed together on a stage coach. Their final destination seems like a relief. The landscape of the west is a great pallet for the Coen brothers story telling. Although these six stories are a bit of a downer, it would be interesting to see it expanded to additional chapters.